fromsymbol will take the individual characters in a symbol and convert them from a symbol back to numbers/messages. bang The word bang sent as a symbol will be converted to a message. The message bang will simply pass through to the output. Any int will simply pass through to the output. Any float will simply pass through to the output. Any symbol will be converted to numbers/messages. def. :nothing The separator character or symbol to be used when converting the symbol to a message. The default separator is a space. 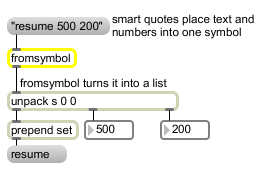 messages lists or numbers: A list of numbers or messages which correspond to parsed contents of the original symbol.